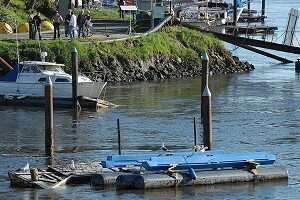 The tsunami of March 11 broke docks and damaged boats in Santa Cruz Harbor. Most earthquake-generated tsunamis in this part of California will cause similar levels of damage. Photo courtesy Sequoia Hughes of Flickr under Creative Commons license. Last week the Bay Area got a tiny taste of Japan’s seismic disaster when tsunami waves stirred our waters, a giant agitating the San Francisco Bay and coast with a flick of its pinky. The waves we saw overwhelming the east coast of Honshu were attenuated to small surges here at the opposite side of the Pacific Ocean. In central California, we will always have good warning of these big seismic tsunamis because they are not created nearby. Our tectonic setting is not conducive to Japan or Sumatra-style tsunamis. But I said seismic tsunamis, the ones that earthquakes cause. 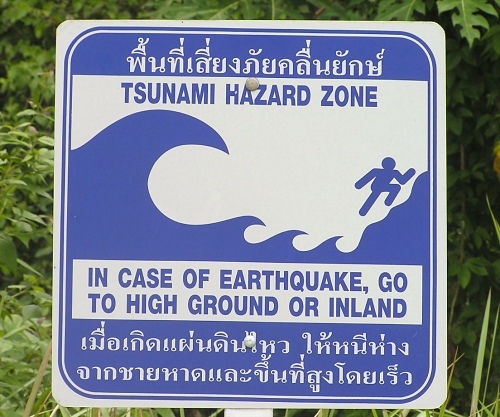 There are two other kinds that mean you should always practice tsunami awareness when you’re at the beach. And National Tsunami Awareness Week, scheduled by purest coincidence for next week, is a good occasion to train yourself and your family. That refers to an earthquake that you feel, not one you hear about on the radio. I can be a little more specific. Don’t worry about small earthquakes, namely the short, sharp shocks we feel often around here. Worry about a long-lasting earthquake, one with slow rhythms. If one of those happens while you’re at the beach, look—you want to leave anyway, because a large earthquake like that may mean trouble at home. If the sea starts acting strange, do what the sign says, period. Otherwise, follow your usual earthquake protocol: Get away without dawdling, drive warily with your radio on, remember your family plan, use your phone no more than absolutely necessary. If you hear about an approaching tsunami, I must advise you: don’t be irresponsible and rush to the beach. We’re all intrigued by geological phenomena, and every red-blooded geologist has “witness a tsunami” on his or her geological bucket list. But remember the person taking pictures at Crescent City (a town also ravaged by a tsunami from the 1964 Alaska earthquake) who was washed out to sea. Think about the surfers who wandered around Santa Cruz Harbor, risking themselves and worrying others, as the waters rushed in and out. But not every tsunami is a seismic tsunami. Two other kinds of tsunamis, not monitored by dedicated networks, have a chance of happening somewhere in the world during the average lifetime: landslide and impact tsunamis. A landslide tsunami, caused by large mass movements into or beneath the sea, is quite plausible along our steep coasts and rugged offshore seafloors. Be wary of one even after a relatively small local quake. An impact tsunami, caused by an object from space crashing into the ocean, has no upper size limit and no preferred location. The odds are small but every beach in the world, ours included, faces the risk. So be like a sailor and always keep your weather eye out.